Where the trail ends on the Notch Mountain hike, a shelter stands as a monument to bygone times. 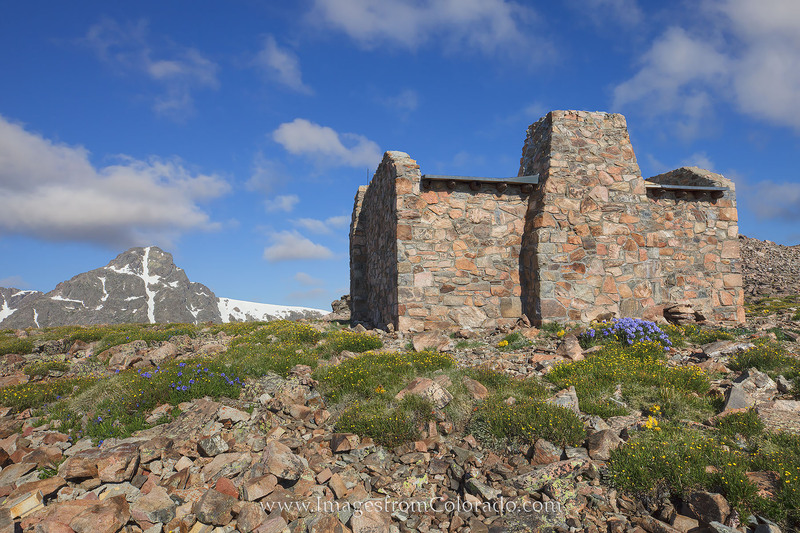 This stone building was constructed in the early 1930s by the Civilian Conservation Corps in order to house pilgrims who made the trek to view the cross (seen in the distance) on the eastern slopes of the Mount of the Holy Cross (one of Colorado’s 14ers at 14,005’). The snow cross was first photographed in 1873 by William Jackson. He sent the photograph back east, and the image created a stir among the religious folks, thus spurring many to make the pilgrmage to this remote portion of the country (especially in the late 1800s) to see the cross. Photo © copyright by Rob Greebon.